But with my renewed sense of motivation for our interior design, I thought I’d re-visit online and have a look to see what their current interior vibe was and came across their House by John Lewis collection. The main thing that caught my attention was the strapline: Affordable and designed for modern living. Yes! I’m going in! What does House by John Lewis offer? Well, everything from towels and beddings, to lamps and sofas! Chairs, storage solutions, mattresses, glassware…basically anything that you may need in your house! Brilliant! 1.Little bit in love with this Swag Ceiling Light and surprised to see it’s only £75 (the industrial look is always on trend and can often be pretty expensive to achieve!). 2. 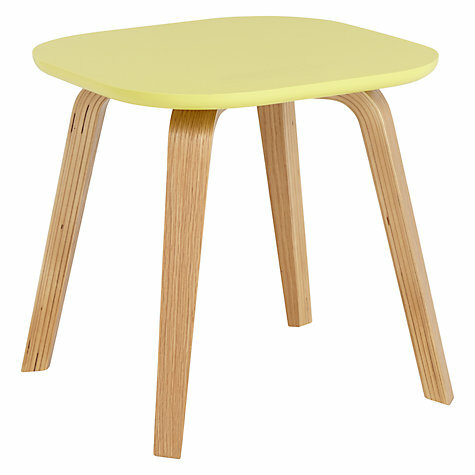 Also loving this small side table, in Dandelion Yellow for a pop of colour. Simple and I like the wooden legs, which will complement some of our mid-century furniture really well! 4. We always seem to have books and magazines lying around – usually industry mags that we flick through now and again. I hate leaving piles on coffee tables (unless it’s a gorgeous coffee-table book I want people to see), so like the idea of this magazine rack that could go on the floor next to our reading chair. Not bad for just £30 too! 5. The sofa! We have a large sofa in our main living room space, but next on our home renovation hit-list, is creating my home-office and separate relaxation space. I want this to feel quite different from the rest of the house and will go for a dark feature wall and book cabinets, to go with my old chesterfield desk and bureau. I’d then like a pop of colour and think this 2-seater sofa could look amazing! And not too bad-a-price for an item like this! I like the classic design, again hinting towards mid-century and a bit scandi-looking too! Don’t get me started – that’s just on first looks! I’m really impressed with the House by John Lewis range – it’s approachable, certainly affordable but still design-led and not compromising the usual quality you can expect from the brand. I’ve definitely got my interiors mojo back now and am starting to piece together each room, how I want to styled and how I can finish them – these pieces may well just appear! I’ll be off to store to do some shopping, so keep your eyes peeled on my insta-stories and back on here, when I do. Also pop over to see my John Lewis inspo from back in the summer. I’m definitely a fan!